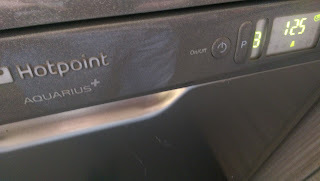 Andy Brown's blog: Hotpoint Aquarius SALT light constantly on, fix! Hotpoint Aquarius SALT light constantly on, fix! If your salt light is stuck on, after filling up, running a few times and it still won't go out, try this. Run a cycle as normal, when empty open the salt cap and pour a whole kettle of boiling water down it. The theory is that it uses a hygrometer to measure the salt in the water and this is done using a float and sensor. If the float gets stuck, it'll keep saying add salt when it doesn't need it, the hot water helps the float move again and get back into the right place. Replace the cap and do as normal, fill it back up and run the wash, it should turn out sometime during the next wash.